Guwahati, Jun 8 : Hundreds of students from seven northeastern states on Thursday gathered on one platform to demand a special constitutional status for the people of the region. 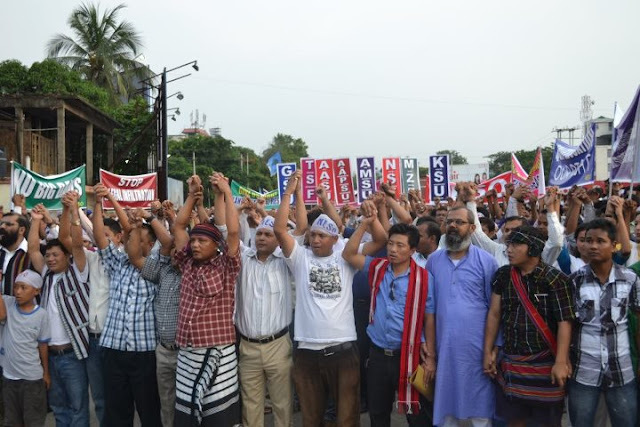 This was the first time that all the student bodies of Assam, Meghalaya, Arunachal Pradesh, Nagaland, Manipur, Mizoram and Tripura held a joint protest under the banner of the North East Students’ Organisation (NESO). The campaign seeks to draw the attention of the central government towards the problems of the northeastern states. It was organised here with the primary demand of a special status for the northeast with rights over land and resources. “We decided last month to launch a massive joint agitation demanding fulfillment of various demands. Our primary demand is a special constitutional status for the people of the northeast India,” said NESO adviser Samujjal Bhattacharjya. He said the next phase would be held on June 29 when demonstrations will be held outside all the Raj Bhavans in the seven states. Bhattacharjya alleged that people of the region have suffered political injustice since 1947.